In Utah's Goblin Valley State Park, three men toppled a giant rock formation that's 170 million years old in just 14 seconds. NBC's Miguel Almaguer reports. Under fire from the Boy Scouts of America and under investigation by law enforcement, two Utah troop leaders who taped themselves gleefully toppling a boulder from a Jurassic-era rock formation in a state park said Friday they should have been more hands-off. 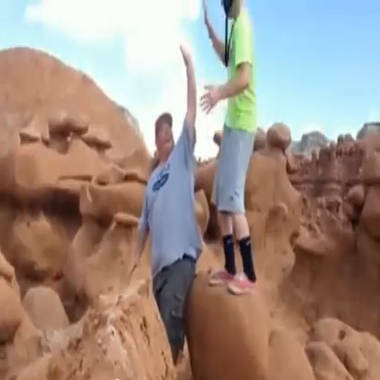 Two men congratulate each other after one toppled a rock formation in Utah's Goblin Valley State Park. The image is taken from a video that was posted on a Facebook page of one of the three men who appear in the video. Glenn Taylor and Dave Hall told NBC News that they acted with good intentions, pushing the massive rock before it could fall on its own and hurt someone, but now wish they had just alerted a ranger. "We did something right the wrong way," Taylor said. Taylor and Hall, who were on a trip to Goblin Valley State Park with eight Boy Scouts, recorded the moment they dislodged the rock from the spot it had been perched for 170 million years. The video, which was posted to YouTube by the Salt Lake Tribune, shows them cheering and high-fiving, crowing that they had saved lives. Taylor struck a pro-wrestling strongman pose and Hall sang the 1990 dance-party hit, "Wiggle It — Just a Little Bit." “We have now modified Goblin Valley,” Hall declared on the video. The footage brought a scolding from the Boy Scouts of America, which has a "Leave No Trace" policy for outdoors activities. “We are shocked and disappointed by this reprehensible behavior," Deron Smith, a spokesman for the venerable scouting group, said in a statement on Friday. The Emery County Attorney's office is looking into possible criminal charges against the duo, although the state Attorney General's Office has decided not to intervene. The longtime scout leaders were aghast that they could face a felony charge for their antics, and said the act was not malicious in any way, although an "adrenaline rush" may have made it look that way. They said they were just enjoying a day of their young charges climbing over the rock formations, which is permitted under park rules. "We came across this two- to three-thousand-pound boulder that was resting on about an inch-and-a-half-thick, razor-thin ledge of dirt," Hall said. "Upon putting a little pressure on it, you could see that it was moving and just then a couple of families walked up right below that rock and went around it…and stopped for a family photo. "And the thought that went through our minds was if this would have fallen while they were coming up that valley, up that very well-used walkway, numerous fatalities would have happened." In retrospect, they say, they should have just told a ranger of the hazard. Instead, Taylor went up to the rock "and with one arm put a little bit of pressure on that [and] it went right over," said Hall, who acted as cameraman. Taylor admitted they were amped up by the sight, but said it wasn't done for kicks. "It was spectacular to watch something like that," he said. "It was not 'let's go tear Goblin Valley down.'" Hall said one of the scouts they were watching could easily have knocked over the boulder by accident. "I wonder if we just jumped on the rock and it fell, would this be a felony?" he said. But park officials said the pair were out of line. “This is not behavior that is appreciated or should exist in state parks,” Eugene Swalberg, a spokesman for the park system, told the Deseret News.